The NH-U12F is the newest version of the NH-U12, which won over 100 awards and recommendations from leading international web sites and magazines. The NH-U12F can be rotated by 90° on all sockets, boasts full compatibility with AMD's new AM2 socket and comes equipped with a Noctua NF-S12 120mm fan, which has a minimum noise rating of only 8dB(A). Thanks to the 4 Dual-Heat-Pipes, 38 aluminium cooling fins with a total surface area of more than 5000cm² and soldered joints for optimal heat-transfer, the Noctua NH-U12F achieves superior cooling performance at minimum noise levels. Kao što smo i očekivali, do značajnijih razlika između coolera (ako izuzmemo Intelov) došlo je tek nakon overclockinga popularnog Q6600 G0 procesor na 3.6GHz pa je stock HSF tu otpao iz igre, dok je Noctua NH-U12F postigao sasvim solidne rezultate. Tu wyraźnym liderem okazuje się Noctua NH-U12F, która oferuje świetną wydajność przy naprawdę niskim poziomie hałasu. Przy wentylatorze pracującym z prędkością 700RPM okazuje się ona praktycznie bezgłośna. 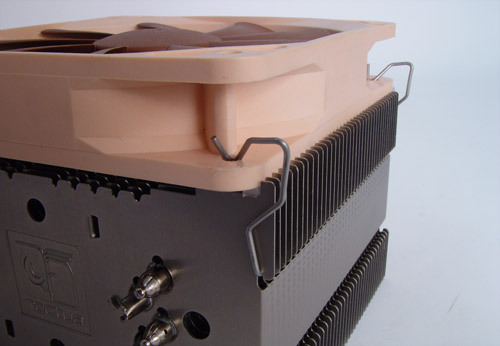 Drugim z wyróżniających się produktów w tej klasyfikacji jest radiator SilverStone a, który współpracował podczas testów z wentylatorem Noctua S12-1200, identycznym jak w przypadku coolera NH-U12F - hałas towarzyszący pracy Nitrogona NT-06 i Noctuy NH-U12F w tym przypadku jest więc identyczny. Im Praxistest zeigt sich der NH-U12F zu Scythes Mugen trotz etwas kleineren Maßen ebenbürtig und bietet neben der Option, einen zweiten 120mm Lüfter zu montieren, noch Reserven für absolut geräuschlosen Betrieb. Da die Ausstattung bei Noctua besser ist und die zusätzliche Halteklammern, ausführliches Handbuch in Farbe, Anti-Vibrationsstreifen und ein mitgelieferter Widerstand, der die Lüfterdrehzahl unabhängig von Software/Lüftersteuerung reduziert, geben wir dem NH-U12F trotz höheren Preises den Vorzug und somit eine uneingeschränkte Empfehlung und damit auch einen Award. As you can see the Noctua NH-U12F outperformed the other two coolers. 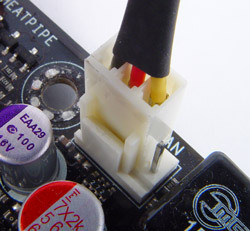 At idle the temperature of the processor rose only 1.6°C above the room temperature with the NH-U12F. During load the processor got 10°C less hot with the NH-U12F than with the stock Intel HSF. Besides cooling much better, the NH-U12F was also a lot more silent than both other coolers. [...] Much to my surprise the Ultra Low Noise Adapter barely increased the temperatures. The processor only got 1° hotter with the U.L.N.A. and that's almost negligible if you take the higher room temperature into account. It seems the NH-U12F needs very little airflow to keep the temperatures low. The temperatures without the fan are also still OK. In fact, when you compare the results from this chart with the first chart in which I compared this cooler to the standard Intel heatsink you can see that the NH-U12F without active cooling gets 2°C less hot than the actively cooled Intel heatsink! 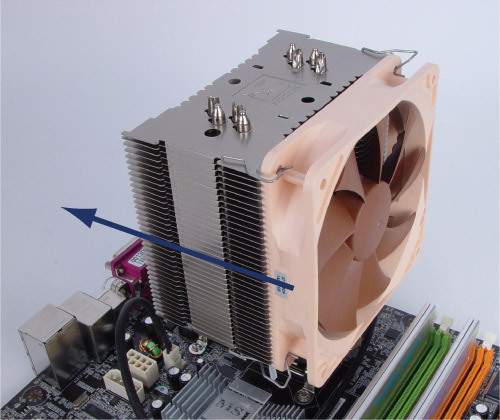 For standard clock rates, this cooler hangs with best and is probably the quietest CPU fan this test bench has ever heard. When the U.N.L.A. 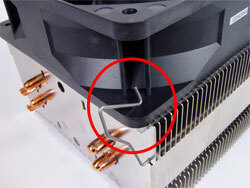 is attached, the fan produces almost no noise above the base line of the system. 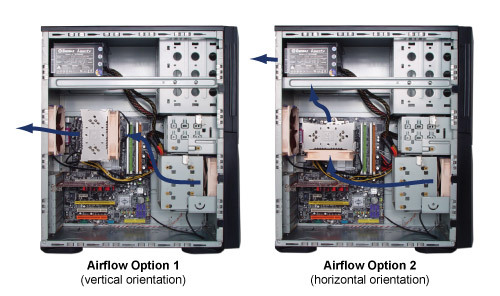 Even though it had half as much airflow, the temperatures remained the same for the stock speeds. This is a huge indication of how much capacity this cooler has. 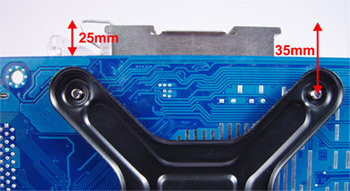 In regards to the chipset cooler, it is definitely doing its job. 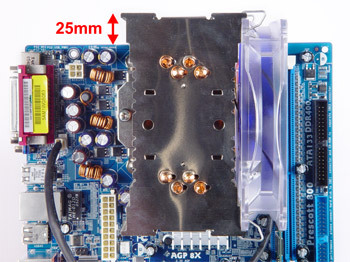 The motherboard temperatures did not rise above +1C from room temperature the entire time. Sowohl der Kühler von Noctua als auch von Scythe unterbieten sogar die 55-Grad- Grenze (Nocta 51,3, Scythe 53) und arbeiten somit fast 15 Grad kühler als mit dem Intel Pentium 4 550. 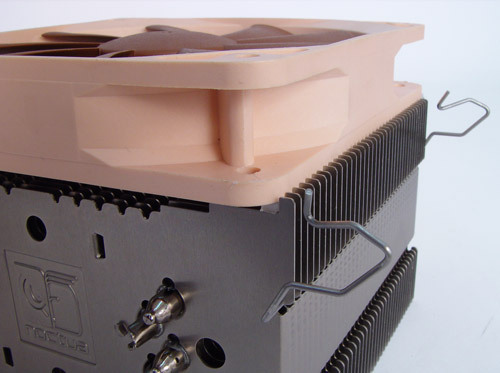 Very impressive, the Noctua NH-U12F can take the lead of all the heatsinks tested here. 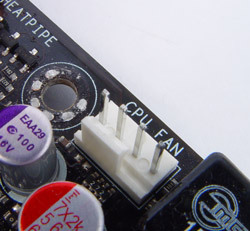 Especially when heat load is not extremely high it gains quite a nice margin compared to the other heatsinks. Po ~30 minutowym wygrzewaniu procesora wyniki ciągle na bardzo dobrym poziomie. Freezer 64 Pro dorównuje co prawda Noctui, pamiętajmy jednak, że jest to zupełnie inna klasa produktu. O wiele głośniejszy – ponad 2200RPM i gorszy jakościowo. Wychładzanie – jeden z najważniejszych parametrów. Bardzo istotne jest z jaką wydajnością radiator potrafi rozproszyć nagromadzoną energię cieplną i schłodzić rdzeń/rdzenie CPU. Także i tu Noctua nie zawodzi. Przez około ~1 minutę, zarówno w trybie standardowym jak i U.L.N.A, NH-U12F jest w stanie zmniejszyć temperaturę o jedenaście stopni. I wszystko to w otoczce głuchej ciszy ;). 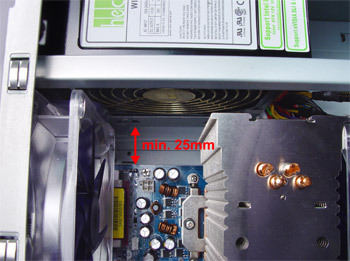 In the end the Noctua NH-U12F is a carefully balanced system of heatpipe tower and fan, which performs the designed task of cooling with silence extremely well. It is also a decent performance cooler, reaching overclock levels near the best tested. Where the NH-U12F really set itself apart from the others was on the noise front - there was virtually no fan noise that we could make out above background noise levels. Which mainboards are compatible with the NH-U12F?